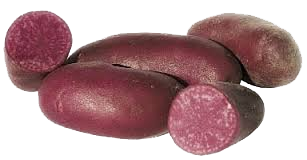 AmaRosa is a mid-season fingerling potato with a smooth bright red skin, and deep red flesh. These creamy nutritious fingerlings are great for baking, roasting, and grilling. AmaRosa also make fantastically colorful potato chips as they retain their bright red olor when fried. AmaRosa is a mid-season fingerling potato with a smooth bright red skin, and deep red flesh. These creamy nutritious fingerlings are great for baking, roasting, and grilling. AmaRosa also make fantastically colorful potato chips as they retain their bright red color when fried.